Asmech was invited by one of the UK’s leading crisp and snack supplier to manufacture a machine with an air rinse facility to be integrated into their existing filling line to remove debris from the base of the containers. This system will accept containers in a single file line, and using side gripping conveyors transport the containers through 360 degrees. After the bottle have been inverted 180 degrees they will remain upside down for approx. 1.2m before being returned to the original orientation. Whilst upside down a series of blow nozzles will blow filtered air into the containers to remove any debris or dust from inside the container. This process tends to be the start in any filling process as the air rinse facility meticulously removes dust and other residues from containers – laying the cornerstone for care-free filling. Which and how many rinsing media are used for this purpose? This decision is completely up to you. That’s because the rinsers can be individually adjusted to any task. 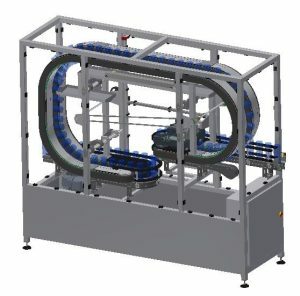 The rinser’s equipment and configuration can be customised to a wide variety of different tasks and requirements: from the spray nozzles and the control system, to the number of media channels. Consult the Asmech product specialists to identify the right variant for you. To ensure the cleaning media reach every part of the container, the nozzles of each rinser are pre-set exactly to the task at hand. That enhances the efficiency of the cleaning, and at the same time cuts media consumption. The Automatic Air Rinser and Bottle Vacuum uses dual action nozzles to first blow air into a container to dislodge dust and debris and then vacuum the dust and debris from the inside of the container. This air rinsing bottle vacuum also moves containers through a curtain of de-ionized air prior to the rinsing process to neutralise any static charge that may be on the containers.